Marrying without permission of the king was dangerous business for a possible heir to the British throne. Though she had no desire to become Queen, King James I of England (also King James VI of Scotland) feared his cousin, Lady Arabella Stuart – daughter of Charles Stuart, had designs on the throne. Like James, she was a granddaughter of King Henry II. But all Lady Arabella really wanted was to marry William Seymour, 2nd Duke of Somerset. Like Arabella, William was also a descendant of the Tudors. While she was fourth in line, he was sixth. Their desire to marry caused further suspicion in James – who never really believed her claim that she had no desire to be the queen. In 1610, Arabella followed her heart and secretly married William. The punishment for her elopement was imprisonment. Her husband was imprisoned in the Tower of London, while Arabella was imprisoned in the home of Sir Thomas Perry. Because of this, they were able to exchange letters – another secret eventually discovered by King James. In anger, he ordered Arabella transferred to another location. Before she could be moved, Arabella feigned illness. She and William had an escape plan. They were to meet in Kent and sail to France. Dressed as a man, Arabella made her escape. Sadly, William took longer than planned and the ship sailed before he arrived. He boarded the next ship, but never caught up with Arabella. Her ship was stopped before it reached France and she was taken to the Tower of London. Heartbroken, never to see her husband again, and never to leave her prison, Lady Arabella starved herself to death. Is there a romance reader or history lover among us who doesn’t love a good legend? Rest assured, with Lady Arabella, there is a legend. It may not have much credence, but let’s pretend for a minute that it does because it certainly adds to the effect of the story. Legend has it that within a year of their marriage, Lady Arabella gave birth to a daughter. That would mean James did not find out about the marriage right away. Perhaps Lady Arabella and William lived in a secret hideaway for a year before James found out about their marriage. After their imprisonment, James sent scouts to search for the baby, but Arabella’s lady-in-waiting, Mary Dyer, was said to have taken the infant to the country. She claimed to have adopted the baby, and named her after herself – Mary Dyer. When the infant Mary Dyer grew up, she married her foster mother’s cousin, William Dyer. Within a couple of years, William and Mary emigrated from England to Boston, in the Massachusetts Bay Colony. 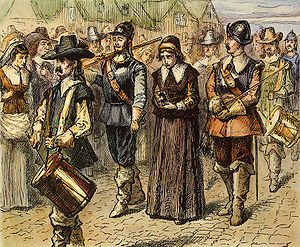 Puritans and members of the church in Boston, the Dyers were highly regarded. But things wouldn’t always remain that way. In October of 1637, Mary gave birth to a stillborn daughter. Her delivery was attended by her friend, Anne Hutchinson. Anne was part of a movement known as antinomianism – a theological doctrine that says by faith and God’s grace, a Christian is free from all law. This was a direct challenge to the belief that the clergy had church and governmental authority over the colonists. Mary and her husband were supporters of Anne and others in this movement. Unfortunately, their association with Anne soon spelled doom. In November of 1637, Anne was accused, tried and convicted of being a heretic. Mary’s husband and other of Anne’s followers were disenfranchised and disarmed. A few months later, Anne was excommunicated from the Boston Church. Some of the women saw Mary leave the church with Anne, and the gossip about her stillborn child began. The governor ordered the infant body publicly exhumed, and they found that the stillborn child had been deformed. He considered this evidence of heresy. Mary and her husband were ordered banished from Boston along with Anne and many of her followers. They went to live in the newly formed colony of Rhode Island where there was no enforced church doctrine. Several years later, Mary joined the Quaker Religious Society of Friends and eventually became one of their preachers. In Boston, a law was passed banning Quakers. Other laws were passed, giving authorities the right to inflict several different horrors upon Quakers who entered Boston. The laws were proclaimed on the street corners, with drums beating in the background. Mary went there to protest, and was arrested and again banished from Boston. This wouldn’t be the last time Mary was arrested. Mary felt led to preach Quakerism, which led to another arrest. After she was freed, Mary traveled back to Massachusetts to visit fellow Quakers who had been arrested. Again she was arrested, and again she was banished from the colony. Still, Mary felt led to Massachusetts. This time when she was arrested, she was sentenced to death along with two other Quakers. The two Quakers were hanged, but Mary was spared death and forced to return to Rhode Island. Mary, standing up for what she believed was right, returned to Boston to speak out against the law that she felt was wrong. Arrested, and sentenced to death again, Mary was given the opportunity to recant her beliefs, but she refused. Mary insisted she was sent by the Lord, and angered the governor when she said the Lord would send other servants to do His work. She was made an example of, as a warning to other Quakers who might dare enter Massachusetts, when, on June 1st, 1660, Mary Barrett Dyer was led to the gallows, a mile from her jail cell, accompanied by soldiers and drummers, and was hanged on the Boston Common. This was a tragic end for the woman who some think was royalty as the secret daughter of Lady Arabella Stuart. But she believed she was sent by God to fight for freedom of religion, and even upon the threat of death she stood up for her beliefs. I know I would never be as outspoken as Mary, but I would like to hope that if the situation required it, I'd be willing to die for my beliefs as well. It should be noted that Mary’s maiden name on her marriage certificate to William Dyer was actually Barrett. If the legend of Lady Arabella’s secret baby is true, then perhaps history recorded the last name of Mary’s foster mother incorrectly. It should also be noted that the legend may have begun through one of Mary Barrett Dyer's descendants in the early 1900s, and that he based it on family documents. Right or wrong, I can't help but admire Mary for standing up for the religious freedom of others. I think she was courageous, and I'm not sure I'd be able to be as bold as Mary. My heart broke for Lady Arabella and William. 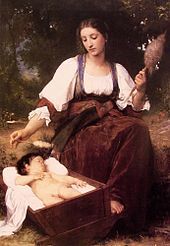 Do you believe the legend of their secret baby? Are there any legends in your family history? Wow, lots of interesting twists and turns in that story. Our family legend is that we descended from one of the signers of the Declaration of Independence, John Hart. But because there is also Indian blood on that side of the family and some records have been hidden, it's hard to prove. Oooh, true or not, what a delicious story. Nothing even remotely interesting in my family history. Oh, well . . .
That was GOOD! What an inspiring woman! We have all sorts of family legends, enough I could probably build multiple novels out of them, and if I ever go back to historicals, that's probably where I'll start! Dina, I had heard about Mary and wanted to learn more, but it was all those twists and turns that drew me. There's actually a lot more to both stories, but of course it would take days to tell. There are a couple of legends in my family, too. One is about an Indian baby found on a trail, and because my ancestors took her in, she became my great-great-grandmother. The other legend is regarding the Huguenot side of our family. DeAnna, it made my little writer brain sit up and take notice, too. I would like to do a bit more research on this one. Poor Arabella. It took her about four years to starve herself to death. Oh, man, Suzie, four years. How awful! Oh, poor Arabella! I have never heard of her before. What a tragedy. I've been inspired by some of my family history since I started doing research on ancestry.com. I knew about the Huguenots and my great-grandparents in Tennessee whose families fought on opposite sides of the Civil War, but there are so many more stories in the family tree. In fact, I'm doing some research now for a new story based on something I picked up in my husband's family tree. Thanks for the post, Suzie! Thanks, Niki! I do think thinking about family legends is very inspiring for historical writers. Lol, DeAnna. But please, don't stick your head in the oven. I always wondered about women who threatened to stick their head in the oven. I never could figure out how that would work. Seems too me your back would give out before your oxygen supply. Fascinating story, Suzie! So sad for Arabella! But Mary was such a woman of faith! Wow! I've discovered Quakers in my family tree, too, but they came from Ireland to Pennsylvania instead of Mass. Maybe that's why they didn't go to Boston! Sharon, I think Mass was a very bad place to be for Quakers. Can you even picture Quakers being persecuted by Puritans? It really seems so unbelievable. Fascinating on many levels. oooh, a secret baby story! (Tee hee) But more compelling is the treatment of the Quakers in MA. I had no idea! I have a great grandmother who was disowned by her family for marrying below her station ( and clan). On the other side is the old Henry Hudson connection. I wish someone would check that out. I don't even know if he had children before he was mutinied. I'm sorry I missed this story earlier in the week, Suzie!